Many engineering steel components used in power generation plants are operated at creep regime temperatures. This means that the steels are susceptible to creep and stress relaxation. It is important to estimate the amount of creep strain accumulation during stress relaxation in order to evaluate creep damage. The estimation of creep strain accumulation and creep damage during stress relaxation is particularly complicated in the case of weldments due their inherent inhomogeneity, presence of stress concentrations and the presence of defects. The purpose of this project is to follow-on from earlier studies in understanding the creep deformation behaviour of austenitic stainless steel weldments. Figure 1 - Left -Test set up for impression creep testing on HAZ slices, right – a HAZ slice. 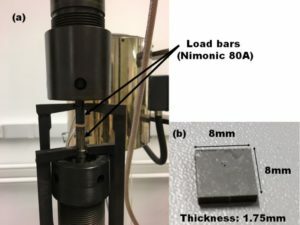 The best engineering practices for design and assessment of austenitic stainless steel weldments operating at creep regime temperatures (such as the R5 method) do not consider the elastic plastic as well as creep property mismatch between the base metal, the HAZ and the weld material in details. The R5 method for example, makes simplifying assumptions on the strength mismatch (yield strength mismatch) between the parent and the weld to achieve a conservative estimate of creep deformation and damage in a weldment. Multipass welds can have significant mismatch in elastic plastic as well as creep properties between the parent, the HAZ and the weld. This project aims to determine relative creep property variation in weldments by experiments and then using the information to demonstrate an assessment route which considers the relative elastic plastic and creep property variation in a weldment to predict creep deformation in it. The project aims to conduct experiments to assess the variation of creep rates in the HAZ of an ex-service thick weld and use that information to simulate creep, stress relaxation and creep fatigue behaviour of an austenitic steel weld using finite element analyses. 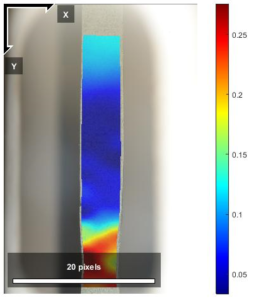 Impression creep testing has been done on thin slices of HAZ material from different distances of an ex-service thick weld to determine the relative variation of creep rates in the HAZ. DIC creep tests on crossweld specimens from the same weld are being conducted to assess the distribution of creep strain rates in the entire weldment. Following the tests, a finite element model for the weld will be developed and benchmarked with the test results. Results from the model will be compared against the standard design assessment route provided in R5 to demonstrate if it is necessary to consider multi-material models in the high temperature structural integrity assessment of weldments. Figure 2 - Strain results from a DIC creep test on a crossweld specimen showing highest accumulation of creep strains in the weld. The project will provide a useful insight on the modelling of thick weldments for creep deformation and damage. Depending on the outcome, it will determine the need for multi-material creep modelling of weldments and if creep testing of HAZ of different weld designs is necessary for a less conservative and accurate prediction of weld creep behaviour.